Drunk driving laws have existed in the United States for over 100 years, after New York became the first state to enact legislation banning people from driving while intoxicated in 1910. The first crude version of a breathalyzer was designed in 1936 by an Indiana University biochemistry professor to identify when a person had had too much to drink. Yet, even after all this time, Americans continue to make the decision to get behind the wheel when impaired by alcohol. According to Mothers Against Drunk Driving (MADD), about 28.7 million people admitted to driving while drunk in 2013. The national Centers for Disease Control and Prevention (CDC) reports that over 9,900 people were killed in alcohol-related crashes in 2014, accounting for about a third of all traffic-related deaths. Sadly, the state of Delaware is no exception to the drunk driving rule. In fact, a CDC survey reported that 2.7 percent of the state’s population admitted to driving after having too much to drink in the month leading up to the survey, higher than the national average, and MADD states that 40 percent of the state’s 2015 traffic deaths were alcohol-related. Not only do these accidents drain valuable taxpayer dollars, they are a serious and dangerous threat to the safety of everyone on the road. 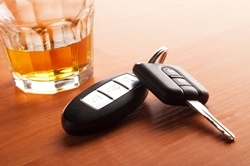 What Constitutes Drunk Driving in Delaware? Like every other state in the country, Delaware has specific laws defining intoxication and banning drivers from driving while under the influence of alcohol. In Delaware, a blood alcohol content (BAC) level of .08% is considered legally drunk. It is against the law to operate a vehicle at this level. Though the level of intoxication depends on a number of factors, including weight, gender, how fast the drinks were consumed, and more, a person will reach a BAC of .08% after about four drinks in a one-hour period, according to the CDC. One drink is defined as 12 oz. of beer, 8 oz. of malt liquor, 5 oz. of wine, or a 1.5 oz. shot of 80-proof liquor. .02% or about two drinks: At this level, it becomes more difficult for a driver to visually track a moving target and perform two tasks at the same time. .05% or about three drinks: Here, drivers can experience the previously noted effects in addition to reduced coordination, difficulty steering, and a diminished response to emergency situations. .08% or about four drinks: At this, the legal intoxication limit, drivers struggle with speed control, concentration, memory, and perception of surroundings. .10% or about five drinks: Driving difficulties mount even more at this level of BAC, with drivers now also having trouble maintaining lane position and applying the brake properly. Obviously, the more alcohol a person consumes, the more difficulty they will have safely operating a vehicle. However, even in smaller amounts, alcohol has substantive negative effects on driving ability. The safest way to drive is completely sober. What Can Delaware Drivers Do to Stay Safe on the Road? Drive only completely sober. Even one drink is one drink too many. Don’t let friends drive when impaired. Take away their keys, give them a ride, or call them a cab. Designate a sober driver at the beginning of the evening. Having a plan from the start helps reduce confusion and sets a standard that is easily followed. If you have guests, be aware. Offer some non-alcoholic drink options and make sure your guests depart with a safe driver. Call authorities if you suspect another driver is intoxicated. Don’t hesitate to contact someone who can help if you see another driver traveling excessively fast or slow, drifting out of his lane, or behaving erratically. Despite the best efforts of safety advocacy groups and responsible drivers, drunk driving accidents still happen, leaving victims to face serious injuries and even death. If you or someone you love has been hurt by a drunk driver, you may be eligible to make a claim. Take a moment to fill out our online contact form, and you’ll hear back promptly from an experienced member of the Morris James Personal Injury Group to help you learn more about your rights in Delaware.